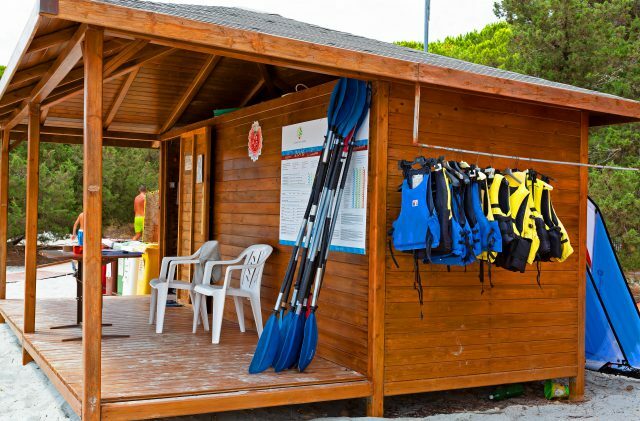 On your active holiday in Sardinia at Camping Cala Ginepro, against the wonderful backdrop of the Gulf of Orosei and the Biderosa Nature Reserve, you have access to numerous equipment hire services for fun, relaxation and sport. If you want to stay physically active even when you’re on holiday, you can come to the campsite with just the bare minimum! At Camping Cala Ginepro, you will find numerous opportunities and all the equipment you need to play your favourite sports or try out new ones. From April to October, during the six-month period in which the campsite is open, you can choose spring, summer or autumn to get involved in a range of activities in Sardinia. Trekking, running, triathlon, mountain-biking, swimming, windsurfing, canoeing, snorkelling, free diving…our island is ideal for all kinds of different sports. At Reception, you can always hire mountain bikes for adults and children, to allow you to go on fantastic excursions. Exploring the surroundings by mountain bike will be a unique experience. You can organise your outings on your own or be accompanied by expert local guides. On the campsite you can also book the multi-purpose pitch/court, which can be used for football, bowling or volleyball, or use it free of charge during the summer tournaments organised by the entertainment staff. In any case, exciting sporting challenges await you! In addition, the beach service is active from 1 June to 30 September, and includes the hire of: sun loungers and parasols; pedal boats; complete kits for snorkelling; and windsurfing equipment and canoes, both one- and two-person, to allow you to really make the most of your active holidays in Sardinia! Discover in detail all of the services and facilities designed with you in mind and choose the one that you prefer. The staff at Reception and the bathers’ assistants on Cala Ginepro beach will be delighted to give you all the information you may require.